We are going to talk today about how we are going to fix or how to highlight first the constraints or the bottlenecks in your business and then how to put plan in place to get them alleviated, so you can increase the productivity of your company. This comes from a great book called, The Goal by Eli Goldratt ,who I was put on to by a guy called Travis Sago, who is an awesome human and a super smart guy, so thanks for that. Basically it’s a story about a parable, a guy who runs a plant in America. He runs a manufacturing plant and he’s got three months to turn his plant around because it’s basically failing and it’s costing and losing money. He goes through a lot of breakthroughs and realizations of why it’s happening and it turns out it’s a series of bottlenecks in his plant at different workstations in his manufacturing facility. Why this is important for one it’s a great classic which is, actually, Jeff Bezos top three books to hand to his senior management , so that says a tonne. Frankly, it allows you to see your business and your whole life in a different perspective. If you think about what makes a business kind of continue to grow, it’s fixing the bottlenecks or where the constraints are, where there is something restricting the growth of your company. What we’ve done and what I’ve found to be really useful is to map out from a bird’s eye perspective your Amazon e-commerce factory, so to speak, on a sheet of paper. Actually, draw it like it’s a factory. We actually ran this on one of our live themed workshops every month with our Mastermind clients. The response we got from the call was really great because they were able to step outside of their business, have a higher, elevated standpoint of what is actually going on and was able to highlight on this map of the factory. If you think about it like a factory floor, there is a bird’s eye perspective of it. I was able to highlight exactly where there was bottlenecks and where there are needed to be systems improvement or a new staff member added or a process tweaks improved and refined – or completely removed. I want that for you. 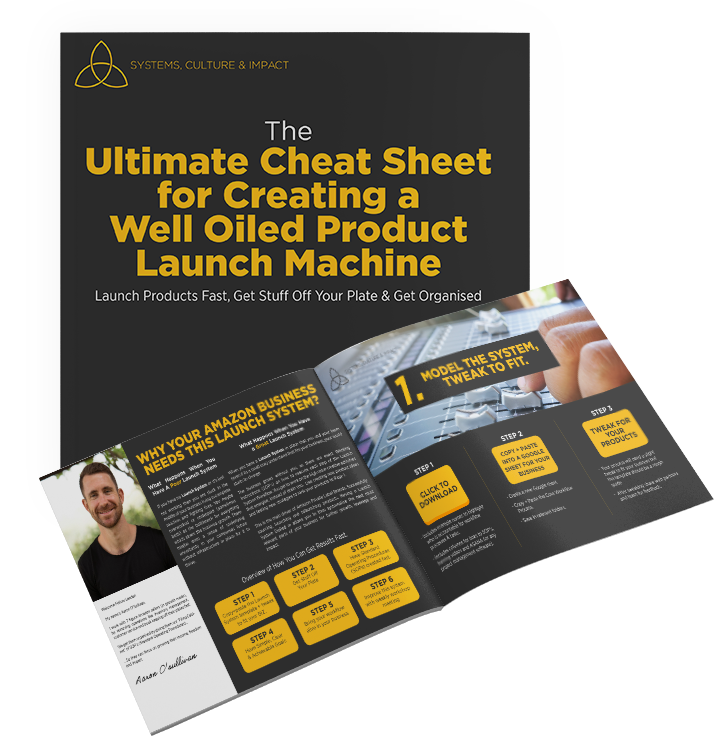 If you want a copy of that exact sheet that we shared with our internal Mastermind clients then drop a comment in the box below and we’ll be sure to get it over to you. It’s really helpful to take that objective standpoint in your business and understand what is actually going on, where the constraints are to continue to grow. The goal is to make money in the business. That’s what the whole book is based around. The goal of any business is to make money. You can use that money to create impact, of course, to generate and grow your business because without money your business doesn’t exist. Your focus must be on how we can continue to alleviate the bottlenecks to focus on growing the money the business can make. So, you can fund business growth, hire more team members and staff so you can continue to scale. If you want a copy of that worksheet, drop a comment in the box below. I’ll be more than happy to get it to you. You can highlight on that factory overview of your Amazon e-commerce business where you are actually in constraints, where you need to alleviate that bottleneck so you can continue to scale and grow. That’s it for now, hope that was helpful. Drop me some feedback in the comments below if it wasn’t clear. Love to help out and I sincerely hope you can continue to build and grow your business so you can build a financial wall around your family with systems and processes and team to strengthen your future. Build that financial wall that nothing can get through. There’s nothing more in the world that I want for you. Take good care now and have an amazing week ahead.